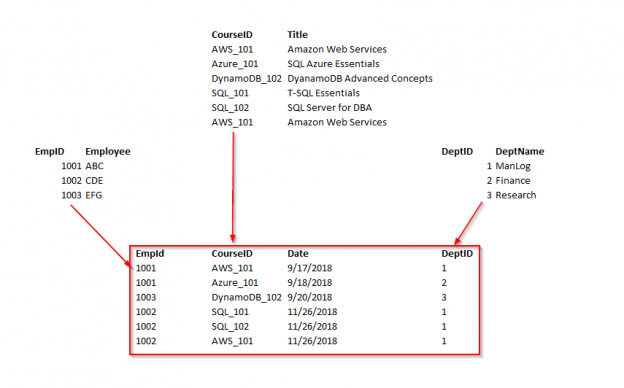 What is Database Normalization in SQL Server? Why is a database normalized? Why is database normalization important? Why would we denormalize a database? Database Normalization is a process and it should be carried out for every database you design. The process of taking a database design, and apply a set of formal criteria and rules, is called Normal Forms. One of the driving forces behind database normalization is to streamline data by reducing redundant data. Redundancy of data means there are multiple copies of the same information spread over multiple locations in the same database. This article is an effort to provide fundamental details of database normalization. The concept of normalization is a vast subject and the scope of this article is to provide enough information to be able to understand the first three forms of database normalization. A database is considered third normal form if it meets the requirements of the first 3 normal forms. In the following example, the first table clearly violates the 1 NF. It contains more than one value for the Dept column. So, what we might do then is go back to the original way and instead start adding new columns, so, Dept1, Dept2, and so on. This is what’s called a repeating group, and there should be no repeating groups. In order to bring this First Normal Form, split the table into the two tables. Let’s take the department data out of the table and put it in the dept table. This has the one-to-many relationship to the employee table. Second Normal Form and Third Normal Form are all about the relationship between the columns that are the keys and the other columns that aren’t the key columns. An entity is in a second normal form if all of its attributes depend on the whole primary key. So this means that the values in the different columns have a dependency on the other columns. Note: Second Normal Form (2 NF) is only ever a problem when we’re using a composite primary key. That is, a primary key made of two or more columns. The following example, the relationship is established between the Employee and Department tables. In this example, the Title column is functionally dependent on Name and Date columns. These two keys form a composite key. In this case, it only depends on Name and partially dependent on the Date column. Let’s remove the course details and form a separate table. Now, the course details are based on the entire key. We are not going to use a composite key. The third normal form states that you should eliminate fields in a table that do not depend on the key. Consider the following example, in the table employee; empID determines the department ID of an employee, department ID determines the department name. Therefore, the department name column indirectly dependent on the empID column. So, it satisfies the transitive dependency. So this cannot be in third normal form. In order to bring the table to 3 NF, we split the employee table into two. Now, we can see the all non-key columns are fully functionally dependent on the Primary key. Although a fourth and fifth form does exist, most databases do not aspire to use those levels because they take extra work and they don’t truly impact the database functionality and improve performance. Database normalization is always a starting point for denormalization. Denormalization is a type of reverse engineering process that can apply to retrieve the data in the shortest time possible. Let us consider an example; we’ve got an Employee table that in-house an email and a phone number columns. Well, what happens if we add another email address column, another phone number? We tend to break First Normal Form. It’s a repeating group. But in general, it is easy to have those columns created (Email_1, and Email_2 column), or having (home_phone and mobile_phone) columns, rather than having everything into multiple tables and having to follow relationships. The entire process is referred to as a denormalization. Again, the basic understandings of database normalization always help you to know the relational concepts, a need for multiple tables in the database design structures and how to query multiple tables in a relational world. It is a lot more common in data warehousing type of scenarios, where you’ll probably work on a process to de-normalize the data. Denormalized data is actually much more efficient to query than normalized data. Taking the database design through these three steps will vastly improve the quality of the data.